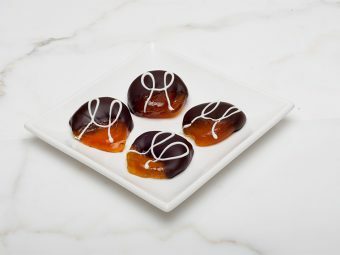 Schmid’s Fine Chocolates of San Clemente is renowned for their high quality, handmade truffles and confections, since 2001. Current owner and chocolatier Kim Maya is dedicated to offering fresh, masterfully crafted truffles made from the finest blend of Belgian chocolate as well as creating her own custom blended chocolate. At the downtown San Clemente shop, Kim and her staff thrive on spoiling you with customer service and sharing knowledge and love of chocolate confections. Come sample individual chocolates or select an assortment for personal enjoyment, gourmet gifts or corporate events. Schmid’s Fine Chocolates began with Swiss chocolatier Hermann Schmid. Born in Luzern, Switzerland, Hermann began making chocolates as a very young man. He learned from Old World masters and made truffles and confections his life work over the next fifty years. Hermann relocated to the Los Angeles area to own and operate six shops throughout Redondo Beach, Santa Monica and Beverly Hills. All the while, he honed and perfected his handcrafted chocolate recipes and techniques, earning recognition as “the best” by The Chocolate Bible – a published book rating chocolates around the United States. After years in Los Angeles, Hermann moved to Orange County and opened Schmid’s Fine Chocolates of San Clemente. Not long after, Kim Maya, a devoted customer and frequent buyer of Hermann’s handmade chocolates, offered to purchase the store. He stayed on to train Kim in the art of the chocolatier and producing quality gourmet chocolates with his secret techniques. Kim continued her education with additional classes in the art of making chocolate. Since 2004, Chocolatier Kim Maya has been the proud owner of Schmid’s Fine Chocolates of San Clemente. Her commitment to handcrafting chocolate confections of the highest quality endures to this day. Come for just one piece of chocolate from the display case or decide to select a beautiful boxed assortment. The real fun begins with special orders of chocolate covered fruits or made from our astounding collection of delightful molds, large and small. We also create hand-made Chocolate Art Boxes and fill them with assorted Schmid’s chocolates and truffles from our collection. These make wonderful gifts and are edible too!! Kim’s commitment to making confections of the highest quality endures today. We hope you enjoy your shopping experience and allow us to spoil you with customer service. And share our knowledge of chocolate with you. Along with all this goodness, you can rely on Schmid’s to provide premium quality Chocolates for everyone… each and every time you visit!